Newcastle’s Wayne Rooney In European Call-Up? As well as the more obvious great news at St.James’ Park on Saturday, there was more positivity thanks to the reserves knocking six past Tottenham. Two stories here I think, the strong look of the reserve team overall and then the emergence of Adam Campell. He came on against Cardiff last weekend and lightened very slightly a dispiriting performance (see video clip below for a lovely bit of skill on 1.30) and gave a very passable impression of a young Wayne Rooney. Against Tottenham he was the star of the show as he hit a stunning first-half hat-trick including a header despite being the smallest on the pitch. We can forgive them their mini collapse at the end having gone 6-1 up and thinking that was it, a valuable lesson learnt for maybe a more important time? This performance certainly suggests that it will be well worth getting along to see the second string this season. With Tavernier signing a new contract, Abeid having a season’s experience under his belt now and the signings of Good and Bigirimana, it certainly has beefed up the look of the reserves. I have a feeling that all of those named may feature against Atromitos FC in the Europa League on Thursday. I think Haris Vuckic is a certainty as well and I would guess could well have been on the bench for the first team if it wasn’t for this impending Greek match. 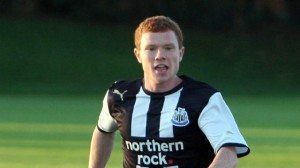 Especially with Shola picking up an injury during the warm up on Saturday, maybe the most intriguing possibility is whether Alan Pardew would throw Adam Campbell straight into the firing line. He appears to have the ability and the confidence…if you’re good enough you’re old enough.